Most of the people are not able to pursue life of their choice due to FEAR of one thing or the other. FEAR is an acronym for Finance Emotion Attitude Relationship. Hence to Conquer FEAR we need to actually improve upon Financial, Emotional, Attitude and Relationship management. F – Financial Freedom: Wealth Dynamics for Financial Freedom – To Discover the ultimate secrets of Wealth and Prosperity. Money plays crucial role in our life. It is a key factor for crucial decisions in our life. Most of the time we are not able to pursue desired choice as we don’t have supporting financial plan. Throughout our life we spend time to study/work to earn money. Let us spend some time to learn Wealth Dynamics which are known-to and practiced by Millionaires/Billionaires throughout the world.This can be our first step towards financial freedom. A – Attitude of Top Performer: Every team has people with different attitude. There are few people who are termed as Top Performers. Other team members always look forward to these top performers for any help and guidance. But very few people actually know that what can be done to inculcate the attitude of a Top Performer in themselves and their team members. “Small Changes in day to day tasks lead to Big Results in future”. This session covers a unique combination of personality attributes which can help people gain Insights about trait of Top Performers and how to inculcate them. Core personality attributes are based on 3C’s strategy which includes Capability, Communication and Commitment. R – Relationship Excellence: Our growth is driven by relationship. Relationship is not just limited to our family. Our professional relationship with customers, colleagues, key stakeholders, is also very important. We can further extend this and cover Health, which is our relationship with our Body. Also these days our focus on spirituality has increased which itself is our relationship with our TRUE SELF. Building Relationship is not a one time activity but it is an ongoing thing which covers multiple factors like communication, expectations, emotions etc. Quality of our life is actually quality of our ability to manage relationships. Hence we need to Master the Art of Managing Relation for a fulfilled life. 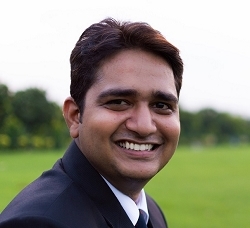 Mr. Vikas Jain is the founder of Adhyan Innovative Learning. An Author, Motivational Speaker, Corporate Trainer, Life Coach and Entrepreneur. He has inspired thousands of people and helped them realize their true potential through Motivational Talks and Seminars on “Emotional Releasing Technique(ERT)”, “Wealth Dynamics for Financial Freedom(WDF)”, “Conquer Corporate World(CCW)”, “Conquer IT(CIT)”, “7 Janmo Ka Bandhan Retreat (7JB)” and more. Its indeed my honour for your support for changing my life .